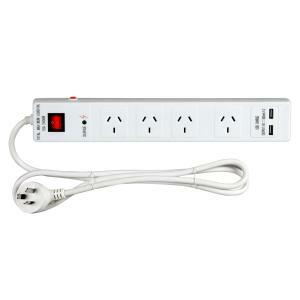 Features: 4 outlets 3-pin socket with 1.8m cord & 2 USB outlets. This Overload Voltage Protection Powerboard features 4 standard outlets, 3-pin socket, 240V AC with dual USB outlets at 5V output on a 1.8m electrical cord and On/Off power switch. Surge protection automatically cuts off when overloaded to protect your electrical appliance. A push button is used to reset the power board. Powerboard unit measurements: 50gm/ 15cm (L) x 6cm (W) x 4cm (H). Colour: White. The Winc brand 100% Satisfaction Guarantee - We want you to love our product, so if you're not 100% happy, you can return it anytime.